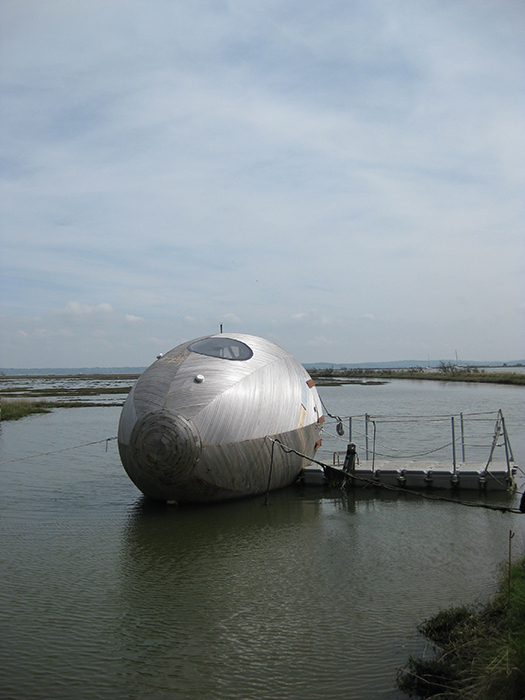 The Exbury Egg. Artist in residence Stephen Turner. The Spud Group. Tigerfox’s experience at the Exbury Egg with Stephen Turner: 30th April and 22nd May 2014. The experience of spending time with and talking to a practising artist has been invaluable, especially so for me, as Stephen Turner is an artist my tutor suggested I look at as part of my degree course. There is much similarity between our practices: an on-going investigation into a local environment that has developed into a detailed study of a surprisingly small area. After having spent the day with Stephen, I found it exhilarating to discover the way each of us is exploring a small section of harbour, whilst continuing to find new things to investigate. I also find it very exciting that we have both chosen an edgeland at this point in time, as the interest in and documentation of these liminal spaces is a developing focus of research. Indeed such books as “Edgelands. Journey’s into England’s True Wilderness.” by Michael Symmons Roberts and Paul Farley and “Off the Map” by Alastair Bonnett, are highlighting these spaces as a “new” terrain to be discovered and explored. We have both chosen an edgeland where the land and sea meet: this space is where man meets a natural element that he cannot control, and it is this interaction between man, land and sea that is under scrutiny. Humanity needs the land to survive, yet the sea seems to be rising and it could well be our actions as a race that are causing this phenomenon. The art works and records we make as artists of these edgelands will offer a snap shot of what is happening over this period of time and will therefore become historical documents. Subsequent art works made in the same place at similar times would continue the record and could make it possible to see changes over time that might not be visible in other ways. The chance to explore a different edgeland, The River Walk at Exbury Gardens on the Beaulieu River, in a similar fashion as I explore Langstone Harbour has added an extra dimension to the body of work I have been developing. I am trying to find a deeper connection with nature through my work and am looking for a spiritual relationship with something larger than myself. I want to participate in the natural environment to achieve a greater understanding of why it affects me personally, still focusing on the landscape and the traditional developmental process involved in producing a landscape painting. Examples of this are immersing one’s self in the environment, becoming one with it and gathering ‘en plein air’ sketches of my chosen location. In this way I feel the approach to my work in the landscape is firmly located in the Romantic tradition of Claude Lorrain and JW Turner. With photography I collect images of the detritus that is washed up along the shore. Each perversely beautiful photograph I take increases visibility to things that we glimpse but may not comprehend. The photographs combine an initial aesthetic attraction and a subsequent contradictory realisation, that this is rubbish. Rubbish on the beach at Lepe. Nature’s rubbish on the estuary edge. With the ‘en plein air’ sketches I am indulging myself in the moment and am trying to capture the atmosphere and my joy at being out in the landscape, looking at and recording the landscape and the weather unfolding in front of me. With the tree pen sketches, I am collecting layers of marks produced by ink pens and water; these marks are produced by the movement of the tree’s branches in the wind and the wind itself blowing the pens across the paper. I am no longer in control of the marks being made; I am offering the tree the opportunity to express itself visually. The paper also becomes a vessel that collects any additional marks left by water, mud, falling leaves and occasionally, animal prints. The work I am producing in this way shows the weather conditions at the time of conception with naturally produced layers of marks within one drawing, visually representing the narrative of the length of creation and conditions at that time. • If it was raining heavily the paper is very wet and the ink gets very smudged and washed out. • If it is drizzling the lines produced by the pens have little water impact marks along them. • If the raindrops are larger, bigger impact splash marks are produced in the ink left by the pens. • If the pen lines have dried out they will not react to water, only the current ones will. • If the wind is strong, the pens produce big sweeping movements across the surface of the paper producing sweeping dancing arcs of ink. • If there is only a small amount of breeze, the pens produce small staccato movements leaving a series of dashes. At Exbury, I produced a record of the passing of time and weather conditions in a group of shorter sketches created on the day. Creating work at Exbury Garden. Photograph of the work in situ. The two days I spent talking and working with Stephen at Exbury have given me an opportunity to meet and enjoy the company of a fellow artist who is involved in an intensive exploration of his chosen landscape. Also Stephen’s Blog and Facebook page have kept me up to date and informed about the on-going, diverse investigation he is undertaking of the estuary. The sharing of ideas and the discovery of common ground has encouraged me to continue with and expand my methods of enquiry, by starting a new strand of exploration into the tideline at Langstone Harbour as an evolving legacy for future generations to discover and interpret. Final year BA Fine Art student at University Chichester.